LLC Leading is a leader in sales of bentonite cat litters in Russia* and is in the TOP-5 rating of all the companies at the cat litter market in the Russian Federation. ** Our products are environmentally friendly and safe, made of bentonite clay, high-tech silica gel and softwood. ** The calculations of LLC “Leading” are partly based on the data contained in AC Nielsen's reports on the audit of retail trade in the category of clumping cat litters in The Russian Federation for 2017, valid for April 11, 2018. ( 2017, "A C NIELSEN" LLC). ** The calculations of LLC “Leading” are partly based on the data contained in AC Nielsen's reports on the audit of retail trade in the category “Cat Litters” in The Russian Federation for 2017, valid for April 11, 2018. ( 2017, "A C NIELSEN" LLC). Kotoff. 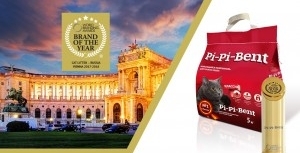 Super premium cat and kitty litter developed on the base of the innovative technology “Mix Product”. It has perfectly balanced qualities: quick absorbing, odor eliminating and clumping power. Pi-Pi-Bent. Eco-friendly litter made of bentonite clay extracted from ancient deposits in Siberia. Its unique properties make your cat’s toilet clean and make your cat or kitten feel more like they are going in a natural habitat. Kotyara. A universal range of high-quality products for cat litter boxes made of silica gel and bentonite. CC-Cat. Best choice for cats fastidious about litter, as well as for fastidious and economical owners. Bentonite, silica gel or wood litters will guarantee perfect hygiene for your cat and your house. Professional. Economical and easy to use, with the perfect combination of price/quality. Clumping litter is a natural product made from natural bentonite clay. Wood litter is made from 100% pure softwood. Every year, all products manufactured by our company undergo voluntary environmental performance certification. Quality control experts confirm that our litters do not contain any components dangerous to humans, animals and environment. The priorities of LLC Leading are modern technology and professional approach. Our product range has high quality characteristics and the company becomes a laureate and winner of the “100 best products of Russia” contest every year. Our cat litters can be bought wholesale from the manufacturer for retail outlets or can be bought retail in almost every pet store or hypermarket in Moscow and across Russia, as well as in retail chains of the CIS countries (Kazakhstan and Belarus). You can choose the best option for can litter boxes which will be inviting for pets of every character and age.